Use paint-able texture to create this sweet terra cotta "cupcake" with a cherry on top. This cupcake makes cute kitchen decor. DCP63 - Blue Bahama --- NEW!! Preparation: Remove all labels and clean surface before painting. Use flat brush and Cloud White to paint saucer; let dry. Use palette knife to apply Texture Thick to bottom of saucer up to rim, building up thicker and rounding off at sharp edges for "frosting". Make slight indention at top center to glue bead handle into once dried. Set aside and let dry. Use flat brush and Blue Bahama to paint pot below rim and let dry. Use flat brush and Geranium Red to paint rim and inside of pot; use round brush to paint wood bead Geranium Red. Let dry. Use large pouncer and Cloud White to paint scattered dots on Blue Bahama area of pot; let dry. Use small pouncer and Wrought Iron Black to paint small dots on Blue Bahama area of pot. Let dry. Use round brush and Geranium Red to paint word "Sweet" on side of pot and let dry. Use large pouncer and Cloud White to sponge paint over textured area of saucer. While wet, sprinkle with Glamour Dust. Let dry and then shake off excess. Glue Geranium Red bead at top center of texture for "cherry" handle of lid. Cut 2 piece of chenille stem and glue inside hole of bead for cherry stem; let glue dry. 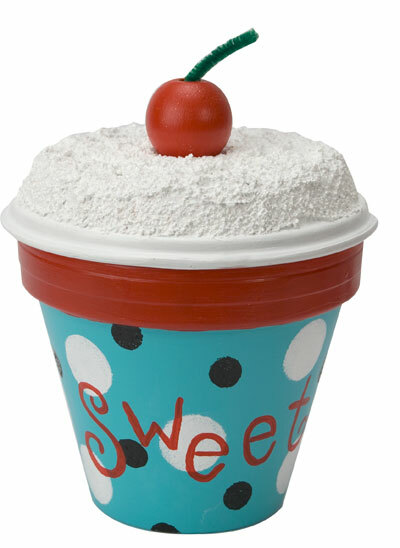 This cupcake pot is the definition of sweet, to be sure! I love the red accents, they go so well with this light shade of blue. Painting projects like this are extremely relaxing, and it would be easy to substitute some colors for others if you wanted to make different colored cupcakes. If you want to make your garden even sweeter and get a chance to relax with some painting in the process, I'd recommend this tutorial!